Recently the upcoming seventh part of the game series has got the fresh set of screenshots and the new spectacular trailer. Also the Assassin’s Creed: Unity release date has been announced. And today Ubisoft company has shared more details about the creation of the new assassins’ adventures. Assassin’s Creed: Unity is supposed to become, probably, the biggest part in the whole series, because for the current moment hundreds of people from ten studios all over the world work on its development. According to the official information, Assassin’s Creed: Unity game will have a huge location - Paris, - which will correspond to the size of the real French capital of the XVIII century. Ubisoft plans to recreate every street of this gorgeous city. But this process requires a lot of resources to spend, so that’s why the company has decided to refuse some other features. As the Ubisoft’s technical director - James Therien - has said, the 4-person co-op mode of the upcoming project won’t include any female playable characters, though originally Assassin’s Creed: Unity game must have had these heroes. But in that case the studio should have redone a great piece of work from animations to costumes. "It would have doubled the work on those things. And I mean it's something the team really wanted, but we had to make a decision... It's unfortunate, but it's a reality of game development”, - Therien has said. 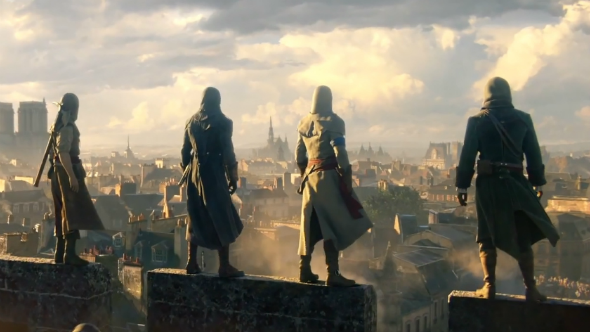 At the same time, the project’s creative director - Alex Amancio - has noted that in the game’s co-op mode each player will appear as a protagonist - Arno, - while three teammates will play the roles of other assassins. So it became the reason to cut the female characters. Let us remind you that Assassin’s Creed: Unity release date is planned for October 28th, 2014. The seventh part in the game series will be available on PC, PS4 and Xbox One. Are you upset with the news about the female characters? Would you like to play one?